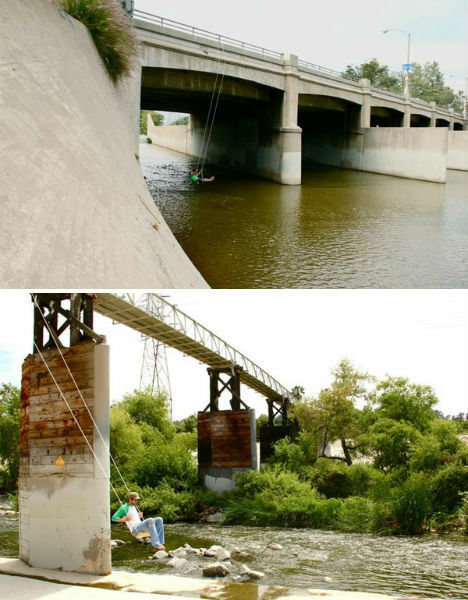 Dangle high up in the sky or from the side of a bridge in swings that have been installed in the most unexpected locations, or enjoy the modern and magical designs of swings that are outside the ordinary. 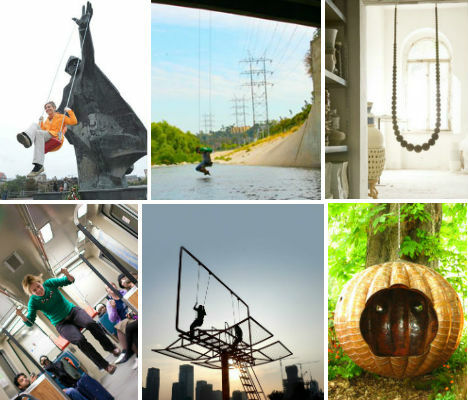 These 15 unusual swing designs range from art installations to awesome products you can purchase for your own home. 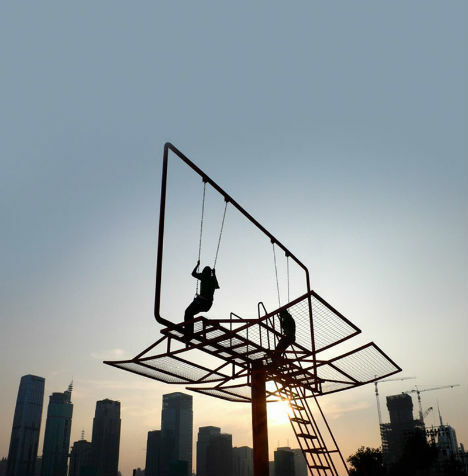 Who (other than those afraid of heights) would turn down the chance to see the skyline from a billboard-height swing? French-Portuguese architect Didier Faustino converted an advertising billboard into an interactive project for the Shenzhen-Hong Kong Bi-City Biennial of Urbanism and Architecture. Garden swings don’t get much more magical than this. 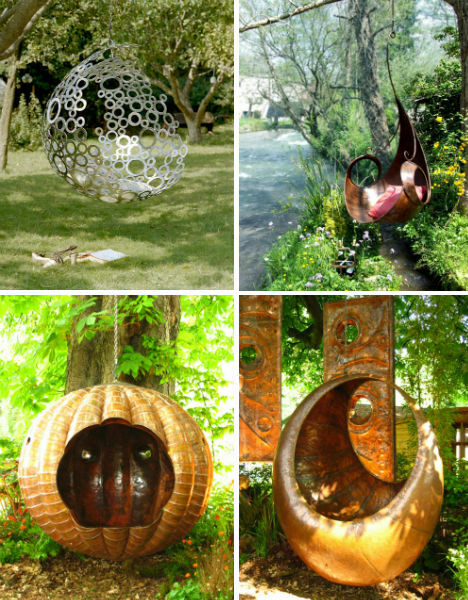 Artists Fletcher and Myburgh have designed a collection of gorgeous swings made of copper; some have an ornate Art Nouveau look to them while others are strikingly modern. 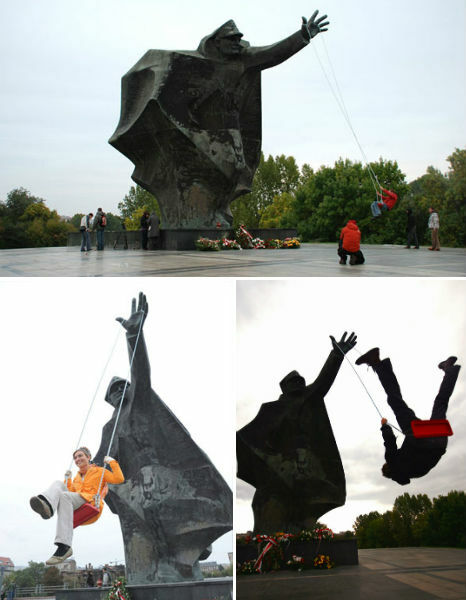 Depending on complexity and weight, the swings run between £2,000 and £19,000. 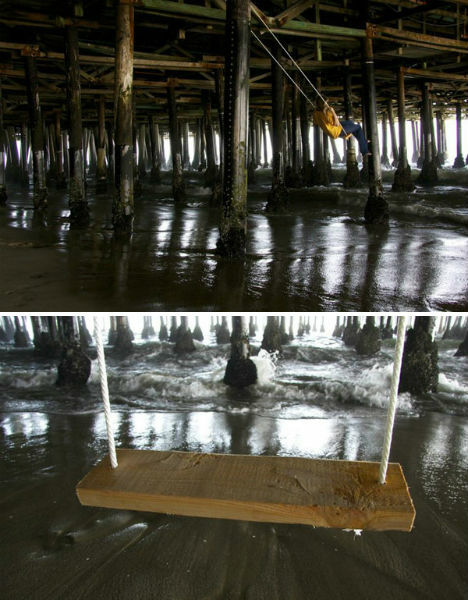 Why shouldn’t we enjoy the spaces under piers, beside bridges and beneath industrial remains? Jeff Waldman’s whimsical swing installations reclaim these spaces for the sake of fun, placing swings in unexpected locations. The swings have graced Los Angeles, San Francisco, the Marshall Islands and Panama. 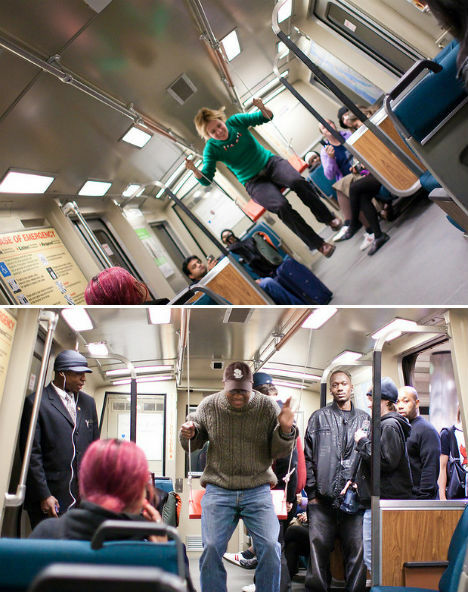 Riding the train got a lot more fun when swings were surreptitiously installed on San Francisco’s BART public transit system. Tied to the handrails, the swings invited riders to play and laugh, and photos were taken to document the event. Just as you adorn your own body with jewelry, you can do the same for your home – but this extra-extra-large necklace serves another purpose, too. 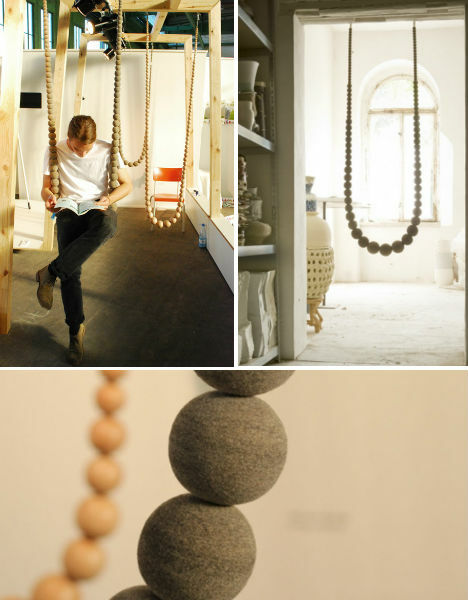 Johanna Richter’s Swing Necklace is a handmade swing made of either balls of gray felt or oiled beechwood, and can be hung in doorways or other locations as both decor and entertainment. 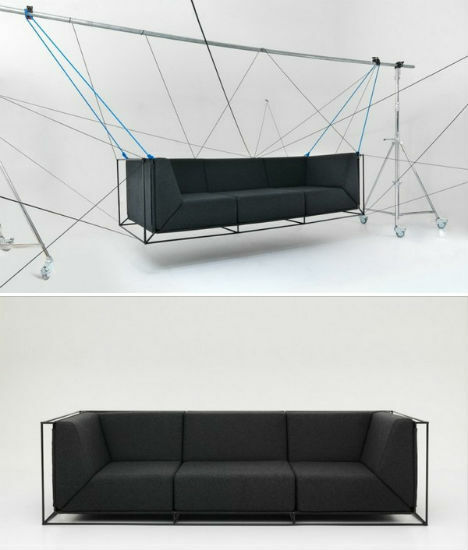 Perhaps more of an art piece than a practical piece of furniture, this floating sofa can be suspended from a steel tube from with cables for a spider-web-like effect. It’s hard to say whether the couch actually swings or just hangs from the frame like a hammock; either way, it’s… interesting. 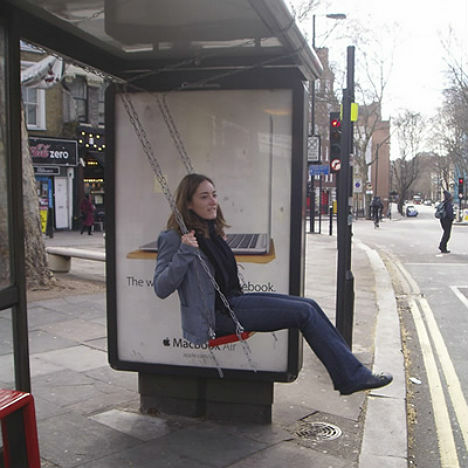 Swinging while eating: a good idea, or not? Perhaps it wouldn’t make for ideal digestion, and it could result in quite a mess, but this dining set is definitely an eye-catcher. 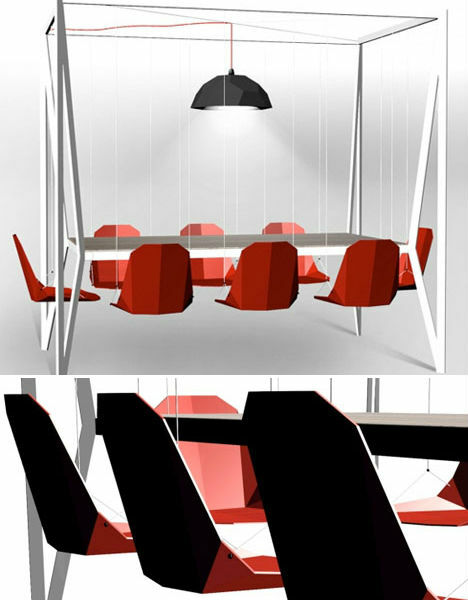 Designed by Duffy, the dining swing set features a frame that hovers over the table, serving as a support for eight dangling chairs in shades of black, red or white. 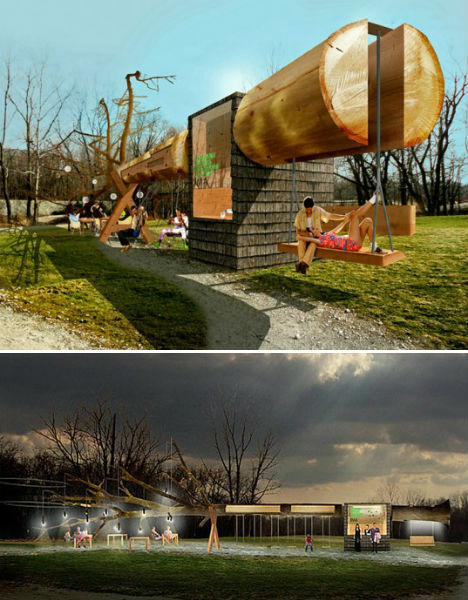 Design firm Visiondivision created an unusual concession stand and swing set made from a single giant tree for the Indianapolis Museum of Art’s 100 Acres Park. Called Chopstick, the project turns a whole tree on its side, stripping it of its bark and using it as a frame for a concession kiosk, children’s swings and a bench swing for adults. 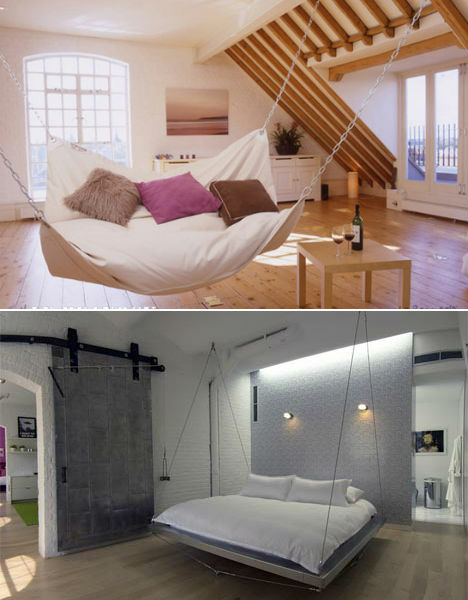 Be warned – if you put a swinging bed in your house, you might just never get out of it. ‘Le Beanock’ is half hammock, half bean bag, and probably one of the most comfortable things you’d ever have the pleasure of experiencing. Bernstein Architecture, meanwhile, offers a whole range of suspended furniture, including beds hanging from cables.